In September 1991, the Liberty Middle School opened. The library ceiling was already leaking. Buckets and tarps were placed there to catch the leaks. 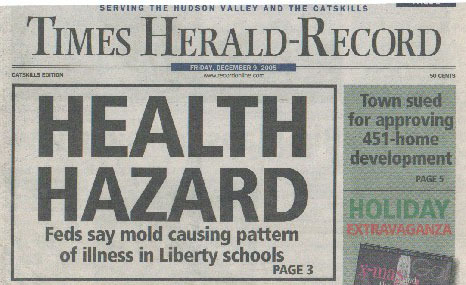 By 2005, after continued leaking causes water damage and mold, NIOSH declared the schools a health hazard. By December of 2007, after serving the district for over 23 years, the school librarian is terminated for not being able to come in due to her health condition caused by the leaking. After experiencing 13 years of exposure to water damage, molds and mycotoxins Angela Page was diagnosed with Hypersensitivity Pneumonitis which later developed into Multiple Chemical Sensitivities (Workers' Compensation Court). Her injury rendered her isolated and rarely able to interact in the world outside her house. Her doctors sent accommodation guidelines, however, she was terminated. See the NIOSH Report, Press, and Timeline for more.